The Fourth Grade Reading and Language Arts curriculum exposes students to works that are written from different characters' points of view. Additionally, the curriculum seeks to challenge students to discern differences and similarities between themselves and both the protagonists and antagonists of the novels read, aiming to create students’ ability to critically engage with the text. The reading curriculum also requires students to begin to identify more challenging vocabulary and to begin to better understand various figures of speech, helping to improve and strengthen reading fluency and comprehension. In order to aid the growth and development in these skills, we teach Latin roots, pre-fixes and suffixes, spelling and word skills. The programs help our students recognize and learn rules and patterns for proper word usage and accurate spelling. In Fifth Grade Reading and Language Arts, students grow in their commitment to lifelong reading and writing for many purposes. Assignments are designed to promote collaboration and critical thinking skills through written and oral communication. In vocabulary, attention is given to learning and assimilating meaning from our readings and study of Greek and Latin roots, and to select accurate, effective, and appropriate words in writing and speaking. Students practice their reading comprehension skills while learning new literacy skills. Students are encouraged to collaborate on small group projects, while building upon skills such as reading, writing, grammar and vocabulary through the integration of critical thinking and hands-on projects. Students are exposed to a variety of literature that is analyzed for character, setting, plot, tone, and theme. Representative titles may include Maniac Magee, The Giver and The Watsons Go to Birmingham-1963 and open-choice novels. The work in Sixth Grade English is designed to challenge and advance the reading and writing skills of the boys. With the overriding theme of empathy, many of the books, short stories, poems, articles and writing assignments use this as the guiding beacon. From the first writing assignment based on the Sixth Grade Class Theme, to the final assignment, a letter to themselves in the future, students are asked to think of others in all they do. The reading curriculum contains five to six novels (fiction, non-fiction, play and journal), a unit of short stories (including classics from authors such as London, McCullers, Myers, Bashevis Singer and Bradbury), and poems with an American Theme (poets of such renown as Dickinson, St. Vincent Millay, Frost, Roethke). Many reiterate this idea of acceptance and empathy. The writing pieces vary in length, style and subject. Some of the pieces resound with the theme of understanding people and their individual situations, while others are connected to either a specific holiday or season of the year. Students are asked to write poems, editorials, analytical literary papers and much more. A highlight of Sixth Grade is the yearlong mystery project. We challenge boys to begin thinking more deeply in Fourth Grade, and writing is no exception. We use this year to put emphasis on brainstorming and outlining in depth. We believe that planning what to write is just as important as the act of writing. We also aim to teach the boys skills, such as proofreading and peer editing, that they can use across multiple disciplines. The year starts with creative writing, focusing on using the five senses to help the boys add detail and description to their work. From there, we move into informational writing which helps the boys develop the research skills necessary to tackle the art of persuasion. This conversation helps the boys to start thinking critically about how to write a thesis statement. Ultimately, we focus on preparing for the speech contest which draws upon all of the skills the boys work on throughout the year. Our hope is the boys enter Fifth Grade prepared for the increasing academic challenges and with a love of writing. With much of the fundamental writing groundwork laid under them, we are able to challenge our fifth graders to write across multiple academic disciplines while thinking about the writing process in an entirely new way. We challenge boys to think of writing as a cyclical process, meaning that there is always room to edit, revise and draft a piece multiple times. To help them gain this understanding, while the boys write their pieces individually, they learn to work collaboratively on peer editing. A goal for the Fifth Grade Writing Program is to learn how to give and receive feedback. The year starts with a study of creative writing and Greek Mythology. From there, we prepare the boys for the challenge of writing a compare and contrast essay that requires them to culminate their learning from the semester and to undertake research to prove their argument. We focus on both the art of writing persuasive and critical pieces in order to further develop our skills. Ultimately, the end of the year focuses on preparing the boys for the speech contest. By teaching a writing curriculum that challenges our learners to make connections across academic classes, we are preparing our students to meet the demands of the years to come. Fourth Grade History begins with the study of world geography and map skills. Boys explore and discuss a variety of themes within geography to ask questions and develop an understanding that addresses the important aspects of early humans and ancient civilizations. The second part of the year continues as the boys move to study hunters and gatherers. From there we continue on to ancient Mesopotamia, which leads to a larger, in-depth exploration of ancient Egypt. Students follow the process of developing, researching, and preparing long-term projects to produce a grade-wide ancient Egypt Museum. In Fifth Grade History, students explore the ancient civilizations of Greece, Rome, and the Middle Ages. Through the integration of technology, research, writing, and collaboration, students research what defines a civilization; learn how geography affected societies, study government and social structure, and the arts. Students will debate the merits of ancient societies such as Athens and Sparta. As the year progresses students will develop greater independence in inquiry-based research with a focus on non-fiction reading skills, and oral and written presentations. The Fifth Grade History content places a focus on a curriculum, which fully engages students in a diverse, complex curriculum in order to create life-long learners and compassionate citizens of the world. Sixth Grade History begins a two-year journey through American history. The title of the course is American History: Beginnings to the Manifest Destiny. The first question the students wrestle with is, “When does American history begin?" 1776? 1492? From there boys study the colonization of America by the European powers with a focus on the creation of the 13 British colonies. Boys go on to study the Road to Revolution, the War of Independence, the creation of the U.S. Constitution, westward expansion, and sectionalism and the debates over the growth of slavery. Skills covered include reading non-fiction text and pulling out information, analyzing historical facts for importance and significance, using historical fiction to learn about a specific time period, and stating an opinion clearly and backing it up with factual details in a clear paragraph. Inquiry based research is a fundamental part of the curriculum. In Fourth Grade Math, students solidify the concepts of place value, reading and writing whole numbers, comparing and ordering large numbers, as well as basic addition and subtraction. Mastering and using new math vocabulary is essential in order to explain, using the proper language, how any solution is found. Joining the music curriculum with a study of fractional notes, the boys begin the year with a unit on equivalent fractions, working on understanding that two fractions with different names mean the same thing. The boys learn to multiply multi-digit numbers and understand long division, and learn to estimate whether or not the solution to any problem is reasonable. They learn to interpret the remainder in division, and most significantly, put their calculation skills to use in solving problems that require multiple steps. A combined unit on geometry and Islamic art, at the end of the year, sees boys putting their geometry knowledge to use to produce a beautiful work of art, using tessellation and repeated geometric shapes. In Fifth Grade Math, the boys begin the year with a comprehensive unit on measurement, including length, perimeter, area, volume and weight, using both “customary” and metric units. The measurement abilities are put to use not only in math but also in STEAM. The boys review whole number operations and estimation before beginning work on the most critical topics in Fifth Grade, fractions and decimals. Fifth graders study all operations with both decimals and fractions, and treat the two areas of study as just two alternative ways to accomplish the same goal. As with all math topics, they use their capability to calculate with fractions and decimals to solve real world problems. The Sixth Grade Mathematics program focuses on extending number sense through problem solving. There is a writing component that requires students to reflect on the solution process and explain their strategy. Mastery of operations with fractions and decimals is expected, as rational numbers are applied to the concepts studied throughout the course, including measures of central tendency, ratio, proportion, percent, exponents, and probability. Integer operations are introduced. There is an emphasis on the skill required to read a word problem and write an equation by assigning a single variable and solving algebraically. Plane geometry concepts of area and perimeter are expanded and applied. Students are encouraged to speak Spanish in every class, with a focus on pronunciation and accent. By year’s end, boys can discuss and respond to prompts about their feelings, likes and dislikes, physical description, families, and their school environment. They are able to make comparisons between their life in the U.S. and life in Spanish-speaking countries. Boys are exposed to culture, food, and music, and they continue to practice their Spanish by performing skits, raps and songs. There is a focus on vocabulary, spelling and grammar. In Grade Five there is a strong emphasis on communicative skills, and using prior knowledge to express ideas and feelings. 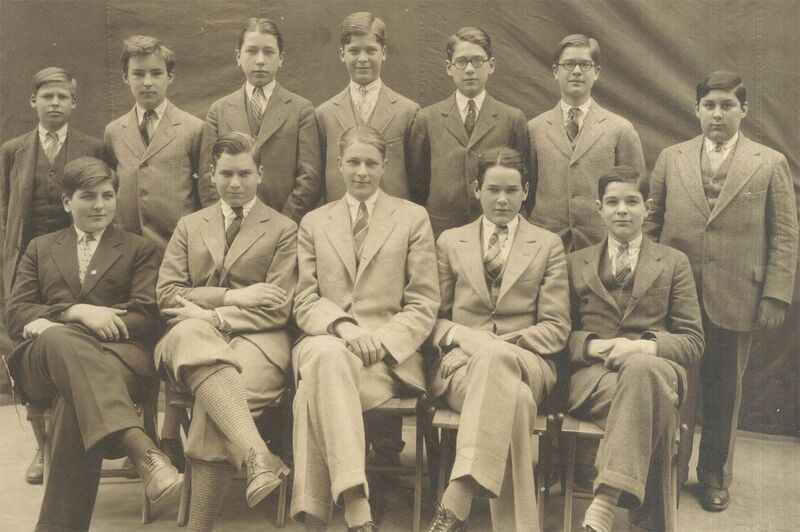 Cultural comparisons and other themes are introduced, and boys practice their oral skills in class discussions. They are also taught circumlocution so they do not need to revert to English. Tests and quizzes are still used, but these are supplemented by other types of assessments, such as PowerPoint presentations, iPad projects, and class performances. In Fifth Grade, boys have many ways to express their growing proficiency in Spanish. The grammar and vocabulary content in Fifth Grade builds on the fourth grade curriculum, adding more irregular verbs, object pronouns, and simple commands. By the Sixth Grade, boys have a solid foundation of grammar and vocabulary, which allows them to move towards the next level of proficiency. They use their Spanish skills in project-based units that require research, collaboration with peers, discussions, and oral presentations. Presentational communication is stressed. 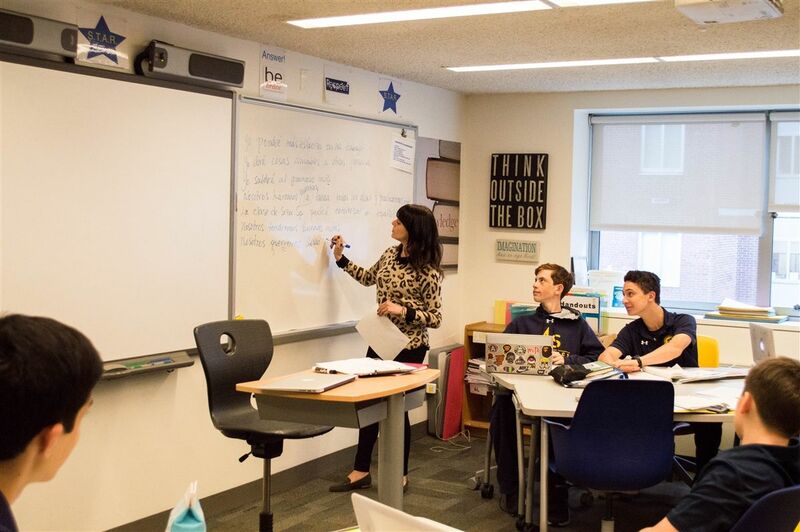 Boys also continue to advance in their study of grammar, covering topics like direct and indirect object pronouns, pronouns used with commands, and verbs in different tenses. Along with oral proficiency, listening and reading comprehension are stressed in Sixth Grade. Listening comprehension and reading comprehension exercises require the boys to take what they’ve heard or read and analyze and discuss the material. Science for Fourth Grade begins with an introduction to the Engineering Design Process (EDP). Boys work with a partner to design, build, and test-launch stomp rockets with flight patterns maximized for altitude and distance under controlled conditions. A unit centered on a trip to Dead Horse Bay is next. Boys begin by testing water quality (salinity, pH, turbidity, and temperature) but then engage in a multifaceted research project. They investigate artifacts (bottles, chinaware, and toys, among other things) from 1953, and many specimens of various animal species (both dead and alive) they collect on the trip and bring back to the classroom. A physical science unit on static electricity and lightning, magnetic fields, current electricity, and the forces behind them follows. The year ends with a unit on the Human Body Systems and a guided dissection of a fetal pig. Science in Grade Five is a study of life, physical and earth sciences. The year begins with Plants and Food Security, which includes maintaining various herbs in our rooftop Woolly Gardens, cultivating lettuce and other greens from seed using EarthBoxes. We connect our learning to the real world through studying the current facts about childhood hunger in the United States. We continue with a mini-unit on Exploring Science Tools in which boys become experienced in the proper use of five “tools” – graduated cylinder, metric ruler, protractor, triple-beam balance, and butane micro-burner. The centerpiece of the year is our unit on Chemistry. Foundation knowledge on physical and chemical properties, changes in matter, mixtures, atoms and elements, molecules and compounds follows as we explore the 3D geometry of simple examples using molecular models. During our study of Rocks and Minerals we establish a foundation using a variety of online videos and articles about earth’s structure, the major types of rocks, rock cycle, and streak and hardness criteria. As the end of the year closes in, we open an entire new world of protists and other microorganisms using a research-grade compound light microscope. We prepare slides, watch tiny organisms swim by, and learn about an entire, invisible kingdom of living creatures. The main goal for our science class in the Sixth Grade is for the boys to become better problem solvers. Through our study of light and its interactions with the eye, sound and its interaction with the ear, the changing earth and nutrition, the boys will have the opportunity to learn by observation, research and experimentation. Many times throughout the year, boys will generate their own questions on a topic and will create their own experiments to answer them. They will learn what makes a good question and what makes a good experiment through repeated modeling and discussions. As they grow more independent, the boys will be able to see the process through from what is unknown to what is discovered. Lego Robotics in Fourth Grade is a class designed to introduce concepts integral to computer coding including computational and algorithmic thinking, applied mathematics and technical writing to students in a fun and interactive manner. It is a challenge based class where boys are presented with a number of problems to solve using their robots that are based on real world robotics applications. The challenges are designed to provide multiple routes to success so that boys can devise their own solutions. 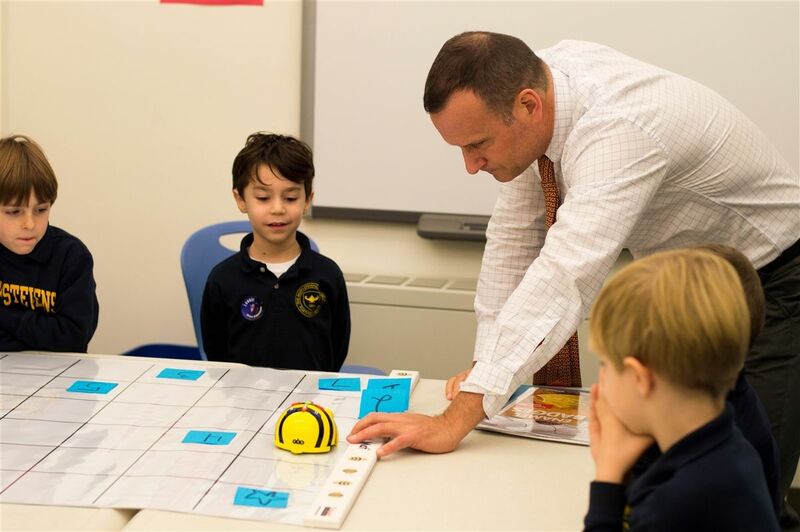 Robotics Class culminates in Robo-Fest in which boys must pose a problem and then design, build and program a robot that can solve that problem in a practical manner. This exercise emphasizes creativity, problem solving skills, and all of the S.T.E.M. disciplines within an activity that boys can get excited about. STEAM V is a transdisciplinary (Science-Technology-Engineering-Arts-Math) class for student-centered collaboration, communication and critical thinking. The theme is climate change and its effects on waterside dwellings. Boys work throughout the year on several real-world challenges, culminating in the partnerships devoted to selecting a waterside location using GoogleEarth, researching its weather and climate conditions, testing appropriate green building and insulation materials, creating a blueprint and/ or SketchUp rendering of their ideal home, and “purchasing” materials including solar panels or wind and hydroelectric energy kits within a $100 “budget.” In building the actual model, many problems are solved and features re-designed. Once completed, models are tested under conditions that simulate extreme weather, and boys gather to reflect on improvements and, finally, to present their structures to a team of architects for critique, and to parents, faculty and staff. The class is co-facilitated by 5-7 Middle School teachers from the various STEAM disciplines and involves the entire fifth grade class. In STEAM VI, boys continue to practice, and expand upon, the skills they began to develop in STEAM V. Beginning with a reading of Forge, by Laurie Halse Anderson, the boys begin to investigate the conditions the Continental Army faced while wintering at Valley Forge. Pulling historical facts out of this work of fiction, the boys compile a list of the myriad challenges facing soldiers during this crucial winter. 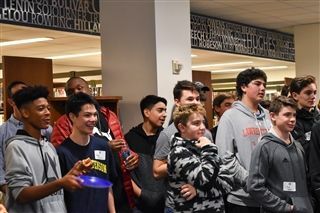 The boys then select one of those challenges, research it in great detail, and, working with a faculty facilitator, use the disciplines of science, technology, engineering, arts, and math to design, and eventually build, a solution to this problem. This independent project-based research assignment puts the boys in control of their learning by giving them a choice in terms of what problem they want to solve and the solution they devise to solve it based on the research that they do. STEAM VI culminates in an overnight trip to Valley Forge, allowing the boys to make a real world connection to this turning point in the American Revolution. In this class, there is an emphasis on understanding personal learning styles. Each boy will learn how to effectively use a planner, how to organize and manage their materials, and how to manage their time. The boys are introduced to Canvas (an online learning management system). They start to learn what works for their individual learning styles. Also, we practice oral and written directions throughout the year. To complement the language arts curriculum, we undertake activities related to paragraph unity, topic sentences, and how to identify and use main idea and supporting details. The boys learn how to read a passage and find the 5Ws (who, what, when, where and why) and how to summarize the information. A final part of this class is to focus on test prep skills in relation to both classroom and standardized tests. This class focuses on a broad spectrum of study skills necessary to transition to more independence and to deepen critical thinking skills. We continue to implement the use of a planner and time management skills. The boys start to learn how to plan for long-term assignments. For reading comprehension, the boys learn about the question/answer relationship (QAR) in order to think more critically about what they read. For writing skills, we focus on strengthening introductory and concluding paragraphs. Note taking for tests and quizzes is introduced as well as note taking from a reading passage. General test prep continues this year with the addition of study strategies and memory skills. Skills class is centered on the idea of the skills necessary to become a more independent student. There is a large focus on self-advocacy and prioritizing time. The use of the planner and using it effectively is still a key emphasis as the students learn how to better manage their time in and out of school. Locker management and organization is introduced and reinforced throughout the year. A more structured approach to note taking across all classes is emphasized as well as how to effectively use notes for tests. Learning how to make their own study guides is a part of this class as the boys learn more about the most effective ways to study. We spend a lot of time learning how to share books through various methods such book talking and creating video book trailers. We delve more deeply into genres, for example, examining the different types of biographies. Our discussions about books emphasize more complex responses to texts, as the boys become better at making predictions, inferences and empathizing with the characters. We participate in the state book award program, which gives the boys an incentive to experience books that they wouldn’t normally consider reading. It also is the start of a multi-year discussion about what makes books worthy of an award. Research projects continue full steam at this age including a very deep study of Ancient Egypt. Boys are frequently collaborating together, helping to design research questions and executing their research with increasing independence. Boys learn to take paraphrased notes prior to creating a product to demonstrate their newfound knowledge. Other digital fluency skills such as locating copyright-friendly images and using a variety of applications are also woven through our work together. Boys at this age are enthusiastic doers and our classes capture this energy and shape their skills so that they are ready for the next stage. We share books through various methods such book talking, writing online reviews, developing interactive quizzes and creating video book trailers. We delve more deeply into genres, for example, examining the different types of biographies. Fifth grade boys participate in a challenge whereby they read newly published books and try to pick the winner of the next Newbery medal. During research projects boys collaborate together, co-designing research questions and executing their research with increasing independence. By Fifth Grade boys are submitting full bibliographies in MLA format, using an electronic citation tool. They learn to think critically as they evaluate sources and take paraphrased notes prior to creating a product to demonstrate their newfound knowledge. Research topics include Ancient Greece, Ancient Rome, Medieval times and climate change. Other digital fluency skills such as locating copyright-friendly images and using a variety of applications are also woven through our work together. Boys at this age are enthusiastic doers and our classes capture this energy and shape their skills so that they are ready for the next stage. By the time boys enter the Sixth Grade they are enthusiastic, independent users of the library. They have developed fluency and confidence as readers. Proceeding up through Grade Nine, we encourage the boys to expand their reading horizons, experimenting with new genres and challenging themselves with more complex texts, both fiction and nonfiction. As they become more sophisticated readers, they learn to pinpoint the appeal elements in books and how to use these to connect with other readers. Just as we foster intellectually curious and ambitious readers, we prepare our boys to inquire and think critically when pursuing research goals. In the sixth grade we conduct research projects about the colonies and the road to the American Revolution as well as a STEAM (Science, Technology, Engineering, Art and Math) investigative project about overwintering at Valley Forge. In the context of cross-curricular, collaborative projects, we teach the boys how to locate, evaluate and cite sources, as well as how to ask meaningful questions and draw conclusions with the goal of creating new knowledge and innovative solutions. As members of a highly networked society, we emphasize digital citizenship, understanding media messages, and the importance of learning to use the Internet to foster self-learning and connect with the world. Technology & Digital Fluency is taught through the integration of digital tools into curriculum, as well as stand-alone projects, classes, and discussions. Topics of study include desktop publishing (touch typing, formatting and layout) digital media creation (graphic design, video, podcasting), programming and computational thinking (Scratch and Lego EV3) and essential skills of digital citizenship and behavior. In Fourth Grade, the boys complete a second year of touch-typing instruction. They become more facile with Word and Pages to create essays and creative documents. They also have yearlong instruction in robotics and programming (Scratch and Lego EV3). In Fifth Grade, the boys engage in a yearlong STEAM course which integrates engineering, 3-D design (SketchUp), filmmaking and sound editing, as well as creation and presentation of ideas using presentation software. Additionally, boys add to their physical mastery of skills by instruction in the etiquette of digital software. In Sixth Grade, boys participate in a yearlong digital fluency course as integrated into their skills curriculum. The nature of this course is to discuss and encourage healthy habits on the Internet, including but not limited to social media, online behavior, and personal safety. In Fourth Grade Art, students work on a long-term project called “Invented Civilizations.” The students first discuss elements of a civilization, such as: government, technology, economy, religion, ethics, culture, and language, among other things. Each student then invents his own civilization, be it past, present or future. Students begin the semester by taking notes about their civilization -- they then sketch their artifact, make a map, and create an invented historical document that would have emerged from their civilization. The students spend most of the term building an artifact made out of clay that reveals some important aspect of their invented civilization. This curriculum runs in tandem with the students’ study of ancient civilizations. In the case of their art project, they are not illustrating moments in history, but come to understand that an artwork, in this case an artifact, has a specific meaning, and reason for being created. The students create the relevant context, a civilization, in which the artwork is actually fabricated. In addition, this project marks the first time that students are asked to create a clay sculpture that is made over time and that is demanding and ambitious. In doing so the students are developing new skills in their use of clay. In addition to craft, independent thinking, problem solving and inventiveness are emphasized. In Fifth Grade Art, boys focus on printmaking techniques. Boys begin the semester by looking at contemporary prints, as well as examples from Art History. The boys create a series of monoprints for their first project, including large-scale prints pulled on giant glass plates. Boys often work collaboratively to create these large pieces. Boys go on to create a series of relief prints using styrofoam, and collagraphs built up with cardboard, and a variety of material, which we print using the printing press. In creating multiples through printmaking, the students come to understand the predecessors of mechanical reproduction. In addition, learning about pattern, design, composition and color are an integral part of the project. Collaboration, independent thinking, inventiveness and imagination are emphasized. In Sixth Grade we focus on developing students' drawing skills, working both from observation and imagination. We begin the semester by creating contour drawings and then use these skills in order to create surrealist drawings. We then study shading, drawing simple still lifes that include the basic forms of cones, spheres, cubes and cylinders. The class then studies one-point perspective, drawing both cityscapes and interior scenes. Students look at work from the Renaissance as well as contemporary art for inspiration. The semester culminates with stop-motion animation drawings in which they incorporate the technical skills they've learned while combining their own ideas about social issues. The class examines several stop motion videos and focuses on the video work of an Argentinian graffiti artist named Blue. In addition to focusing on social issues, the drawing animation assignment emphasizes themes of transformation, movement, and point of view. Understanding how to tell a story through the sequencing of images is key in the stop motion project. Teamwork, independent thinking, originality and problem solving are all emphasized. In Woodshop the boys design and build replicas of pinball machines with a spring launcher and flippers. Boys work individually or in groups, and spend their time developing pieces and making adjustments to ensure that the projects are functional and complex. An emphasis is placed on engineering moving parts to get the ball moving in the machine. Some boys also incorporate electronics into the machines that use sensors that light up when the ball moves over an opening. Inventiveness, problem solving, originality, independent working and thinking are emphasized. In addition, students are encouraged to help each other problem solve. In Fifth Grade Woodshop, boys focus on integrating aspects of science, technology, engineering, art and math in the process of building a catapult. They first research the different examples of catapults that were created in history, and how they are designed and function. Boys begin the semester by drawing a plan depicting a side elevation and a top view of a catapult of their own design. They build with an emphasis on scale, proportion and measurement using rulers, protractors and a compass. The boys are encouraged to collaborate and most work with a partner in the construction of their catapult. In constructing their catapult no nails are allowed, the different components have to be joined with dowel sticks only. Emphasis is placed on problem solving, innovation, collaboration and flexibility. In Sixth Grade, boys make electric-style guitars. The boys are inspired by various hand-made instruments and are challenged to think about acoustics and the effect of design on sound waves. In class they learn how to use the electric jigsaw to aid in cutting complex shapes. For safety, they use the jigsaw one student at a time so that the teacher can oversee their work and evaluate their safe working habits. After cutting all their pieces, they laminate wood together and learn to use shaping and filing tools to smooth and form their guitars. The boys use the hand-held electric drill as well as the drill press to drill holes in the head of their guitars in order to insert the machine heads (tuning pins). They will finish them by using water-based enamel paints to create slick designs and details. Original designs are emphasized, as is independent thinking and problem solving. Fourth grade students continue studying the recorder with a concentration on note reading, memorization of short songs, and improvisation. Music classes focus on the performing, reading, and writing of music notes. Classroom playing gives the boys a chance to demonstrate music reading abilities as well as performing together as a group. Sight singing and developing aural skills are a focus of the class as well as the notation of syncopated rhythms. Three-part rounds with improvisatory movement are also enjoyed by all. In addition to performing vocally, on the recorder, and on Orff instruments, students put these basic sight-reading skills into practice through the playing and singing of many songs. All activities are stressed within an environment of cooperation. Games and songs from many cultures are used to stress the importance of community and how we work together to create music. Fifth grade students continue recorder, singing, creative movement and improvisation with more time spent on relating what is on the written page to what we are creating. Rhythmic studies focus on compound meter such as 6/8 and 12/8 time. Harmonic studies include scales, modes and basic blues. These studies culminate in writing and performing a blues piece. Fifth grade students also learn Morris dancing. All activities are stressed within and environment of cooperation. Games and songs from many cultures are used to stress the importance of community and how we work together to create music. 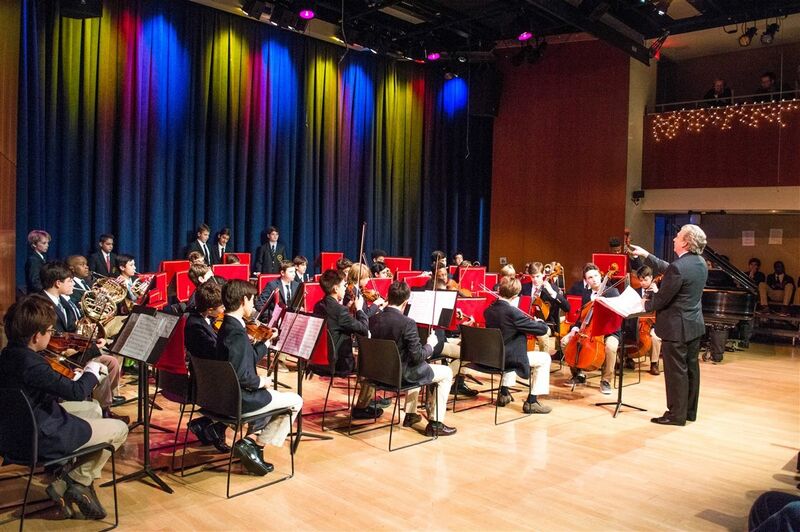 Although Sixth grade students no longer have weekly music classes, they have the opportunity to continue their music studies through private instrumental lessons, and may also choose to participate in Chorus, Orchestra and our annual Gilbert & Sullivan production. Though not mandatory, boys choose to join one, two or all three of these wonderful performing groups. Students approach theatrical presentation from an academic perspective. Fourth grade boys are given performance opportunities through various academic projects throughout the year. One example of this is the Egypt Project. During their spring study of Egypt, students are given a variety of opportunities to present work to small audiences, including an original skit created by the students with the supervision of their teachers. Boys are eligible to participate in their first main stage production, which means they perform for a large audience both during the school day and in the evening. The largest production of the year, the annual Gilbert & Sullivan production for Grades 5 – 9, is where boys get fully immersed in the theatrical process. Run by Theatre Arts faculty, this production gives the boys the chance to explore their “triple threat” qualities; they get to sing, dance and act in this fully orchestrated musical. Students in Fifth Grade may audition for a leading role or they may opt to participate in the chorus. For this show, students work with several professional theatre, music and dance faculty members, and participate in a professionally run rehearsal process. Students have two excellent opportunities to perform in their sixth grade year. In the autumn, they may audition for and participate in a musical at The Nightingale-Bamford School. Working at Nightingale not only allows the boys to work with girls, but it helps them to adapt to different directors, teachers, choreographers and environment, which is fundamental to the theatrical process. In the winter, boys are eligible to participate in the school’s main stage Gilbert & Sullivan production, which includes Grades 5 – 9. Students in Sixth Grade may audition for a leading role or they may opt to participate in the chorus. For this show, students work with several professional theatre, music and dance faculty members, and participate in a professionally run rehearsal process. In Middle School, an A-S boy begins what is considered "formal" dance training. Basic ballet technique is introduced throughout the warm up in an effort to develop hip flexibility and ankle strength. Each student is expected to master across the floor traveling combinations in hopes of increasing balance and coordination. Memorization skills and stamina are put to the test in our weekly combinations, and by Fifth Grade the boys are beginning to choreograph their own dance pieces. If a fifth or sixth grade boy discovers he has a passion for dance and wants to pursue this love further, he can audition for the Allen-Stevenson Dance Company (A.S.D.C.). Fourth Grade Physical Education teaches the importance of living a healthy lifestyle and being physically fit. Students learn and understand the effects of activity on the body, the risks associated with inactivity, and the basic components of health related fitness. Boys are also taught to learn the significance of team sports: football, soccer, basketball, hockey, wrestling, baseball and lacrosse. Importance is placed on expanding the student’s vocabulary on skill terminology and movement concepts, sportsmanship and teamwork. In addition to a weekly field class on Randall’s Island, boys participate in physical education classes. The boys participate in weekly physical education classes in the gymnasium. These classes are designed to build sport specific motor and cognitive skills, as well as, establish a strong base of strength, speed, and agility. The Athletics Program is conducted after school three days a week. In the fall and spring seasons, the boys practice and play games on Randall’s Island. During the winter season, teams use the school gymnasium, multi-purpose room and Chelsea Piers. Our fifth graders participate in an intra-scholastic team program. It is here that the boys learn to manage their equipment, locker room experience, and the demands on their academic schedule with late dismissal times. They also build relationships on the field, court, or ice rink, that lead to a strong sense of team spirit as they advance in grade level. All of these lessons are achieved during the acquisition of sport specific skills and game concepts during practice time. When the boys enter Sixth Grade they may choose to participate on an interscholastic or intra-scholastic team. While many boys choose to compete interscholastically, there are those who find their enjoyment in our intra-scholastic program. The Sixth Grade interscholastic program develops teams that compete against other schools. It is this competitiveness that creates the need for learning advanced skills and concepts as the boys face a new challenge: competing against other schools. It is this competition level that sets in motion the need to be dedicated and hard working in order to achieve success. It is also at this stage when we teach the boys our understanding of success. They learn to put in the hard work, be unselfish, never give up, and to recognize that success comes in many forms.